Managing a rock group is not for the fainthearted and managing The Who was as arduous as it gets, calling for extreme measures in the face of many obstacles. These included a chronic cash-flow situation, profound ignorance of the workings of the music industry, the ever-present threat of the group imploding, a maniac for a drummer and a singer predisposed towards violence as a means to resolve disputes. Somehow, though, Kit Lambert and Chris Stamp kept The Who afloat during the key period of their career because deep down inside they knew that if the ship didn’t sink and take them with it, sooner or later they’d end up sailing it past the winning post. No sooner had they done so, however, than they walked the plank. This is the theme of Lambert & Stamp, a film directed by James D. Cooper that was premiered last night at London’s newly opened and rather swish Regent Street Cinema. It’s a lengthy documentary, perhaps too long at 117 minutes, and its appeal rests largely with Who fans and students of the 'swinging’ sixties, so I can’t see it becoming much of a commercial success. Also, writing as someone who’s probably seen more footage of and about The Who than most, barring the new interviews done specifically for the film, there wasn’t much in the way of unseen vintage material. That said, there was still much to enjoy as the film shed further light on one of rock’s most tempestuous and unlikely partnerships, even if it did at times muddy an already murky pool. There are many versions of The Story Of The Who and this is yet another take on it, with subtle variations that can be attributed to Pete’s notorious tendency to embellish facts, Roger remembering things the way he prefers and Chris Stamp, who appears on screen more than all the rest put together, mostly in interviews conducted towards the end of his life, inclined to gloss over controversial issues. The most reliable witness interviewed at length is probably Richard Barnes, long term Who chronicler and Pete’s Ealing flatmate back in the day, who was promoting a High Numbers gig at the Railway Hotel in Harrow, most probably on July 14, 1964, when Kit Lambert showed up. At first Barnes thought he was a man from the local council come to check that the number inside didn’t exceed safety limits but once he realised Lambert’s true intention was to make a film of the group he duly bid him to enter, thus changing the lives of everyone concerned. In short order Lambert contacted his friend and business partner Stamp who was away filming in Ireland. They decided not only to make a film but to manage this group, quickly ousting His Modness Pete Meadon, a slightly under-the-counter ploy that is not mentioned in the film, thereafter setting about the task with relish. The Who believed Lambert and Stamp to be rich and influential – they were neither – and accepted them as brothers, effectively bringing the team’s core complement to six, and after many hair-raising escapades they triumphed. Success, however, rent the partnership asunder since for Lambert, and to a lesser extent Stamp, the mission had been accomplished and there was nothing left to do, neither being temperamentally suited to the dull but essential administrative duties involved in managing a successful rock group. Lambert also took umbrage to being side-lined from the Tommy movie but by then both had succumbed to the hedonistic lifestyle that riches had brought, leaving The Who’s affairs in the hands of others, mostly notably Bill Curbishley who has been at the helm since 1976, prudently handling all their business matters while consolidating their position and bank accounts. But everyone knows it might never have happened without Lambert and Stamp. The film opens with summaries of their contrasting backgrounds: Lambert, the posh son of a classical musician and music critic, public school and Oxford educated, cultured, plummy voiced, pleasure-seeking, unashamedly gay, immensely reckless; Stamp, the son of a stoker on Thames tugboats, working class, tough, a bit of a Casanova, highly imaginative, also something of a chancer and desperate for a life that would take him away from all this. They do say opposites attract. Having established the characters we move towards life with The Who, and here the film seems unsure of its purpose. 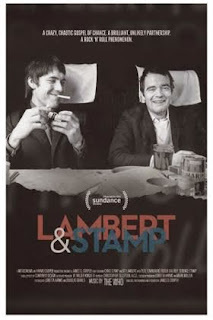 Is it a documentary about Lambert and Stamp or (yet another) documentary about The Who? In fact it flits between the two, the first 25% L&S, the next 50% mostly The Who and the final 25% back with L&S. There’s plenty of previously seen live footage of The Who, snatches of songs up to and including Tommy, and footage of Lambert and Stamp in conversation at the Speakeasy club, all soundtracked by (mostly) Who music, not necessarily in chronological order according to the story on screen. Due space is given to the establishment of Track Records from whence the dynamic duo derived their fortunes, much of which Lambert squandered on maintaining a palace in Venice. Curiously, in the film the multilingual Lambert speaks more German and French than he does English, this no doubt because no decent footage of him being interviewed at length (in English) seems to exist, and, although he was unquestionably the dominant and most interesting figure in the partnership, his voice is therefore seldom heard. So Stamp, by virtue of having outlived him, now silver haired and wise after the event, is the star of the movie. Sadly he will never see it as he died in 2012, 31 years after Kit. There is a good deal of flattery. Stamp believes Townshend and Moon were both geniuses; Townshend states that John Entwistle was a musical genius and Daltrey a great actor who used this talent to become a great rock singer; Daltrey is unstinting in his praise for the efforts of both Lambert and Stamp, although it’s no secret that of all the members of The Who he was the most instrumental in jettisoning them back in 1975. Moon evidently wanted no part of this and made his feelings known. Entwistle barely gets a look in. But there’s a happy ending with Daltrey paying rich tribute to Lambert and Stamp from the stage during a fairly recent solo show and all three of them – Pete, Roger and Chris, along with Bill Curbishley – attending an event in Washington in 2008 when The Who were honoured for their services to music. Finally, the film is not without humour. The rumpy-pumpy with the ballerinas mentioned in Mark Blake’s book Pretend You’re in A War (via Andrew Loog Oldham’s book Stone Free) is referred to by Chris’ actor brother Terence Stamp, also interviewed on screen. Everyone agrees that Lambert chose to live in Eton Square because the address enabled him to get credit from banks and local merchants and Pete, who had a room at the same address for a while, says he was still able to get wine on credit long after he’d gone on the wagon in the eighties. Kit was a gambler, too. If the bank would only cash him a cheque for £30 he’d be off to a casino immediately, his thinking being that because this was insufficient for his needs the best course of action was to risk it on the roulette wheel since only then would he be able to trouser what he required, all assuming he won of course. Documentaries of persons who have passed on usually end with a note of this on screen but this one doesn’t. Perhaps the producers thought it was obvious. Either way, the film does offer another angle on a rock saga that continues to fascinate. And while it would be too much to suggest the destiny of The Who rested on the spin of the wheel at Kit’s casino, we can all be thankful that Barney didn’t send him packing that July night back in 1964. Really interesting review. Now the band, Tommy, Quadrophenia, Keith and Pete have being subjet of DVDs and/or books. There is also a book about Roger. Only John Entwistle, the quiet one, remains waiting to be seen as a interesting character to produce a book and a documental about his life. It was very enjoyable evening - Sorry I didn't get to say hello to you. Saw the film last week in Los Angeles. As a thirty-five-year Who fan, I was surprised by how much I hadn't known about the duo. (And as a French professor, I was amazed at the excellence of Kit Lambert's practically-native-sounding French.) But I am glad I couldn't talk my spouse into going, because despite the reviews I had read that praised it as a great look into the dynamic 60's scene, I also can't imagine this movie appealing to anyone other than Who fans; it is very narrowly focused. Even for me, predisposed to love every minute of it, it really wandered (albeit enjoyably) in the third 1/4. My biggest question after watching it was where Heather Daltrey fit into all of this. Her comments on "looking at pictures of the band" made it sound as if she knew Lambert and/or Stamp first. I know she was around the scene (e.g. being the inspiration for "Foxy Lady"), but anyone know more about those connections? I was looking forward to your review. I may or may not see it in the theater as I'm sure it will be on Netflix, etc. Chris, my wife and I read your review and later today went to the theater to see for ourselves this magical movie. It was made clear that this duo had enough vision and divine grace to unfold a revolution. As victims of the Daltrey voice fubar, we've starved for The Who here in Kansas City. The big screen was enhanced by one thousand empty seats in the venue. It became an intimate viewing of my favorite crew. We were both moved by this film and comes highly recommended with a must see for fans.